Just now, ASCII have opened up a website where the upcoming One Chip MSX can be pre-ordered. 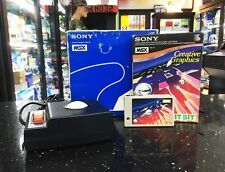 For 19.800 yen (about €145 / $185) this fully MSX1, partly MSX2 compatible device can be obtained. Thanks to FPGA technology, the functionality of the device can be changed without performing any hardware modifications. An upgrade to make the device completely MSX2 compatible will be released in the future. The Dutch company Bazix has already informed MRC they are very likely to distribute an English version of the One Chip MSX on the non-Japanese market as well, of which distribution will start at the same time or shortly after the distribution of the Japanese version has started. From what we understood, Bazix hopes to do a formal announcement in the near future with more specific information. this fully MSX1, partly MSX2 compatible device can be obtained. Thanks to FPGA technology, the functionality of the device can be changed without performing any hardware modifications. An upgrade to make the device completely MSX2 compatible will be released in the future. -also msx2 plus in the future??? Cool! But should the non-jap people wait for Bazix with the preordering? I think I will... I'm guessing it would prolly be a bit cheaper than having one shipped over yourself... Would also be nice to have something MSX with a manual I can read for a change! I will wait the European Bazix release... and hope there will be MSX 2 upgrade! COOL!! !...But I hate wait I WANT ONEEEE !!!!!!!! guyz... do you realize how historical this moment is? KNM: I know waiting is a bore, but we had to wait for a new MSX computer for more than 10 years. A few extra days wouldn't hurt you, right? -I don't see a MSX on it, only a ugly piece of computer hardware. NOOO don't want the times change!! Arenit we obsolete? hahahaha :'( I want a new MSX with keyboard built in!!! FYI: quite a few MSX computers with external keyboards have already been released in the past. Having an external keyboard doesn't make the One Chip MSX more or less MSX. Waiting for Bazix to get the European version. I don’t really care about a tape port (although the cassette relais is cool). I guess I’ll wait for the European version as well. This thing is gonna ROCK! (Especially looking forward to it because in my room here in Utrecht I don’t have an MSX, and I wouldn’t mind having a compact one which I can connect to my PC monitor - the MSX monitor is a little too big, I don’t have room for that here ^_^) (I already got a nice compact keyboard for it). 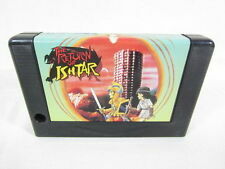 Are any company interested nowadays to make new games to the "new" MSX? For the ignorant (like me) can someone post a quick summary of what can (and cannot) be done with this device? E.g. Can one run own assembled ROM files on it or can software only be on cardridges? > guyz... do you realize how historical this moment is? Would it be possible to connect 2 1cm through expansion slots and to "use" one of theme as an external device (running VHDL code of a V9990, OPL4, and so on)? So, if there is not cassette I/O ports... this new msx is out of the standard? So, if there is not cassette I/O ports... this new msx is out of the standard? The cassette port was removed from the standard with the MSX turboR. I for one won't miss it... Heck, I didn't even remember my NMS8245 had one! I'll go you one worse tho; as of this model, FDDs are outdated too! It's a good thing we've got our SD cards to store all our stuff on! I don’t have any tapes. Well, actually, I do, I have one. But it’s only to look at, it’s an infogrames game where you have to solve a mystery with the help of accessories that come with the game. Anyways, given that it is an MSX1 in the first place, it is a little weird, but I don’t have those cassette games anyway so I certainly won’t miss the cassette port. CF-IDE is a nice replacement for diskdrive, but of course a. it is an MSX1 first (I wonder how long it will take for the MSX2 upgrade to become available), and I wonder if it can run DOS2 (although adding memory mapper logic and a clock chip is probably little effort and perhaps already there), and b. not all games run from CF-IDE. But then again, perhaps the VHDL code can be modded to create a way to emulate a diskdrive, like the R800 can. Actually Tsujikawa demonstraded quite a few MSX2 games to me, running DOS2 with the SD card functioning as a MegaSCSI drive on the -current- version of the One Chip MSX. With EP, there are little games (I believe there is exactly one) that refuse to load. I don't know whether the FPGA code needed to make the One Chip MSX run as an MSX2 with MegaSCSI is included at launch (my guess is not), but it shows the potential of the device. The future of the One Chip MSX is mainly in the hands of the MSX/FPGA community. And from what I've seen, that future is darn promising. Someone asked who would be willing to develop games for this machine? I would! I HOPE this thing comes with a custom keyboard (even if the connector is PC-compatible), because I dont want to use a MSX with "multimedia keys" or a "Windows key"
About the 5000 minimum of pre-orders: does this include orders through Basix? Or are they only for japanese people? Is it possible to use SD cards with the MegaSCSI (on a real MSX)?? I agree to selios2000 what he - or she? - says about casing and keyboard. But can you remove something form the standard? If Turbo R has no tape connector, it isn't standard. To my mind, Turbo R is just a special version of MSX for japanese gaming fans. two devices are still important. If you can read tape or disk even 10 years after, that's another question. code e. g. a processor in a similar way as you would write a Pascal or Modula program. VHDL is just fine, you'll see. What's the fuss about the tape? Why wouldn't you want to use it? Too much free time. MSX in one chip, according with the MSX standard MUST BE COMPATIBLE with all the MSX software from MSX 1 to the maximum MSX level it reach, and it includes carts, tapes and disks. Stupid question: how can I save files in the SD card with a machine that's not the MSX-on-a-chip? Ok, the MSX-on-a-chip can save/load files in the SD card, but I think it's quite useless if you can't read/write these files elsewhere. Is there Windows/Linux/whatever support for such media? Can I save my own programs or games into this card and run them on MSX-on-a-chip? (I know that inserting a disk interface or Sunrise IDE in the cartridge slot would solve such problem, but I wouldn't like to copy megs of data using a 720KB floppy or even lost the only and single cartridge slot with a data storage interface if the MSX-on-a-chip already has an embedded one). I don't use tapes, but remember that too much msx 1 users yes. Also I have some disks (like PRO TRACKER) that I can't execute it from Hard Disk for example. Or some games. Yes don't these people want to use disks or harddisks? Why stick to tape..
WOW! Is the the greatest number of reactions to a recent news topic? Since eveyone else has said something, then so will i!! 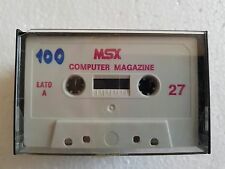 It is quite true that MSX needs a cassette port to be a true MSX machine, there seems to be additions to the basic MSX1 specification such as USB, perhaps some bright young hardware designer could come up with a suitable interface? Why does MSX have USB? It is not mentioned anywhere within the technical manual? Maybe MSX association are planning some new extension(s) to the MSX BIOS? It is exciting times for MSX fans accross the globe! The thing that startled me on the article snout pointed out is how it talks about the new MSX being "open source hardware". A few people might remember that a year ago, in a discussion about "the revival", I speculated that the MSX standard would be more likely to suceed by going open source. Although the MSX Association take on "open source" is not exactly what I meant by then, it's refreshing to see how in tune they are with such concepts as open standards, free extensibility and community empowerment. The MSX revival campaign has gone a long way by now, and it's reassuring to see that, every step in the way, there has always been people to say "this is not going to work", and yet things advanced up to this point -- where real MSX computers are back into market. Sure this is not enough, in the exact way the MSXPlayer, the game reader or the MSX PC weren't either: they were never meant to be "enough", they were meant to be steps. That's how it works -- when you get several steps together, one after the other, ahead you go. More is sure to follow. 1). the price for international ppl is close of the jap one. 2). comes with a nice casing. 3). if it comes with all the needed for flashing the FPGA chip. 4). if in the fpga chips is enought space for more circuitry. ¿why? i wonders what is the excuse why they don't do the fully functional v9938.... maybe there is a pandora's box and realy is not more space. 710 sold. What do you guyz think of the ordering speed? I will buy one if I can order it in Europe, it does MSX2, and the price is reasonable. Latok: I think that orders "speed" is slow... hope it will rise. My mistake latok, ofcourse there have to be pre-ordered 5000 to be produced! But keep on posting those countings! i wonders if we needs to sign up the pre-ordering.... or we needs to way to bazix anoucement? Yeah fly, same here... if there’s a minimum order, which ends at some time... I’d gladly help getting them to 5000! I hope Bazix will announce something soon, so I can preorder. Yet another stupid question about SD cards: ok, I can read them on my PC, but the way MSX-on-a-chip writes data to it, can I read/write it on my PC? Can the MSX-on-a-chip use the full 32MB of a SD card? unless it's going international, that might speed things up. seems to have an order speed of ~3 an hour now. we're over 5000 after 1500 hours. = 2 months to reach 5000? Would be cool, but ordering would have to stay at a constant rate like this then. So he took a month off,and strapped himself into one of those chairs that people on deathrow are on...he's sitting in front of an entire wall with monitors watching this community's every move,a digital voice softly announcing every preordered 1 chip msx. Go check it out yourself ! if the url doesn't work then disable some things in your pc...like take out the HD for instance...who needs that anyway? I tried taking out my HD, but then my computer wouldn't boot anymore? What should I do?!? Do I have a virus or something!?!?! Considering the One Chip MSX to be 'just an MSX1' is like judging a car without even considering you can turn the engine on and actually drive with it. ASCII/MSX Association will already take care of full MSX2 compatibility in the future, who knows what the MSX/FPGA community will add to those features. Take the MSX VDP project from Brazil , for instance. ADVRAM, higher resolution, more colors, no sprite limitations? You got it. Something tells me your reactions would have been quite different if Tujikawa had released the One Chip MSX as ESE Artists Factory instead of MSX Association. If you take a closer look at the MSX World 2005 photoshoot you can see a lot of MSX2 titles were already demonstrated on the One Chip MSX during the fair. Some timing issues still need to be resolved, but the doubts some people have about the FPGA having enough gates to be able to become fully MSX2 compatible are completely unfounded. You sound like Marat Fayzullin stating Gameboy Emulation on MSX is absolutely impossible, but hey... if you want to keep negative about it all until the first One Chip MSX computers arrive in the Netherlands so that you can see with your own eyes that 'the damn thing just works', then that's your choice. I do wonder, though, what gives you reason to believe Tujikawa, ASCII and MSX Association would not be telling the truth in this one. Or what gives you reason to doubt the MRC reports/pictures on the subject. (Or any of the other reports and photoshoots on Japanese websites such as itMedia and retropc, for that matter). With the photoshop-remark you're basically calling me a blatant liar and you're deliberately hurting my feelings. I don't think I did anything to deserve that. Are the demotivating remarks and conspiracy theories ever going to stop or are they just going to become more and more rediculous? I'd appreciate it if you'd take that one back, but then again, it's so much cooler to be negative, demotivating and to search conspiracies behind practically anything, isn't it? Now, usually, a reaction from Bifi comes in stating 'where's your sense of humour, snout. I was just kidding '.....Honestly, Bifi, I agree with snout, you suggesting some photoshopping has been done is kinda lame. Maybe we should open a "Snout's nagging and nitpicking" fanclub? Can I be the first member then? I wonder why all this. Snout you easily resist the critism of Bifi. Simply please tell us, maybe over and over again till it is really clear what you get for your money and what are the changements according to the ESE board (the prelimary version of this new board) we show time after time. Bifi has seen our board ,so he cannot deny that right? You stated elswhere that is the board is quite different . I would like to know what exactly and I refer not to different ramchips ,usbconnectors but purely to the content of the chip. The real price is different from19800 yen is namely exclusive of VAT. If Bazix import this board they had to localize , the extra costs ,margin, will influent the price very high is my estimation. Any indication on this already. Thanks for your reply Rob, but please do understand that Bazix is only involved in the One Chip MSX project as a distributor, not as a developer. I have seen a ps/2 keyboard in action on the One Chip MSX during my stay in Japan, and I have been told that Moonsound etc. should work as well now (though I did not see that in action myself). (^_^( "And........... *countdown* for another 100++ reply topic"
)o_O) "Can it be true? Can it be? Can the famous 2201 topic be beaten?" (^_^( "Tune in next hour, for more gossip, conspiracy, photoshopped screenshots, voltage-problems, pre-order-numbers and 'humour'." |-_-| "cut! ok, we're out of the air"
|-_-| "we're in the air again"
(^_^( "Sofar for the dipers, cheap-loans, French cheese, and other stuff that smells"
)o_O) "' 'ave fun "
Well, it's new, not second hand; that's one. I'm far more willing to pay for something new as opposed to an old second hand msx with scratches and yellow keyboard. Of course, there's the whole "it's not the same hardware so it's not real" discussion that could follow out of this. That could make for quite an extensive discussion actually. Bottom line for me: a new MSX for roughly 1/10th of the price a new MSX costed in 1985/6 is a fairly decent deal. I agree, that I can't see a reason to buy MSX when I actually don't get anything more than I already have. Only difference is, that this new MSX still might have some compatibility problems. If they would start expanding the standard the product would be a lot more interesting. For example, they could add 2 I/O ports to adjust right/left balance of each PSG/FM-PAC/Music-Module/PCM/SCC channel. This way it would be easy to add stereo support to old games and people would buy this new MSX, because they would like to get this new feature. Well, the One Chip MSX already has 2 cinch audio outputs, which means an FPGA developer could add this functionality himself. Or any other (pseudo) stereo effect for that matter. Maybe they will implement it once in a new player ..
Well, the One Chip MSX already has 2 cinch audio outputs, which means an FPGA developer could add this functionality himself. This is my latest MSX demo. To download, click here. The archive contains binary and needed firmware. To make this possible I patched t-state counter and removed PSG and RTC support. I used already well working known PSG I/O support to implement experimental MP3 decoder. To improve performance I also patched VDP to work trough memory on slot 3-3. Unused VDP HMMC command was replaced with texturemap support. BTW I just tried Koen's latest firmware and still has this "feature", that playing third SCC channel will make reading mouse from joystick port 1 to fail. I think, I still stick to GeorgeMSX standard. if i have got time somewhile, i will implement a turbo speed function for improve a bit mnbios performance. or maybe a 5th page! whoa NYYRIKKI! Way cool demo man! Philip just told, that he has managed to squeeze PMSX 8.2.2 to work also in OC-MSX Hardware revisions F and G. He also asked a bit help: "If you have hardware revision J,K or N I would really appreciate if you could test if any of these firmwares work on your device. If none of these work, please test attached file and mail me back the caps-led blink sequence. Hardware revision is typically printed to lower right corner of motherboard in format OCMxxxxxx-HW* where "*" is the hardware revision." Luis Gambado aka Lugo is also working on porting this to Nokia 827 Blueray recorder. does Space Manbow work again with revision N, NYYRIKKI? Samor: AFAIK SpaceManbow actually works with the crappy original firmware, if you don't use any software using VDP adjust registers before you load SM. Unfortunately reset does not work, so I suggest you to update firmware every time before you try to play SM. You can also try GeorgeMSX. With GeorgeMSX the sprites sometimes flicker a bit and sprites are drawn actually one line too early, but you really can't see these problems, if you don't know them. Wolf: It is great to see, that someone is actually looking my demos. I hardly ever get any feedback! Thank you my friend!!! Am I patient man, but people may guess how many things are waiting for the inpatient people right in say a few months, right? Not to mention a means to finally get rid of that vdp pipeline..
> or even simply remove that stupid 4/8 sprites per row limit. indeed! Aleste2 without any slowdowns/flickering sprites at all, anyone? Ok, let's be more serious, but do you think, I have horribly wrong vision? You are already planning, that "these features have bothered me 20 years now, finally I can fix them!" This could have happened with MSX emulators as well, but it seems, that this word "hardware" makes people more open to expand the standard with own ideas. That is good, but if MSX Association is not aware and start to continuously develop the MSX standard, it is possible, that we have soon huge amount of different virtual hardware extentions more or less compatible with each other. From enduser point of view I don't see that much difference with MSX emulator done by software and MSX emulator done by programmable hardware. At least at the moment mobilephone with fMSX sounds more working and cheaper version. At the moment it looks like phones have also more keys than one chip MSX is going to have. NYYRIKKI: I think there's little reason to be negative about that. As long as the required VHDL is bundled with the software that needs it... (or at least available at the same website). In fact a LOT of games would be possible... wouldnt it be nice if the one chip already came with such things pre-made? uh.. MSX/FPGA community? That sounds a bit like it's 'one'.. we agree there's an MSX community, but how many ppz know stuff about FPGA? Might we run the risc that no-one makes new stuff for the 1cm because no-one knows how to deal with FPGA? wolf_ the '/' meant and/or in this case Either way... there are already quite a few members of the MSX Community actively developing in FPGA and I think several others will be more than willing to learn a thing or two about VHDL once they get their hands on a One Chip MSX. As for the FPGA community, the One Chip MSX might be an interesting device as it comes with a nice casing and the standard input and output connectors needed to see the results of what you actually have been doing in VHDL.